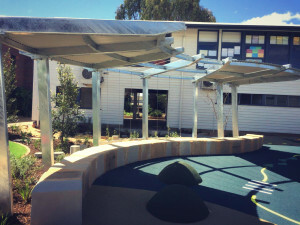 Steel Post & Rail were commissioned by Ausplay Playscapes to manufacture and install the steel structures for a new Recreation and Performance space at Miles State School. 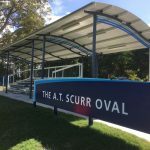 Based on Ausplay’s custom designs, our team fabricated shade structures and handrails that were in keeping with the theme of the space whilst maintaining durability and longevity. 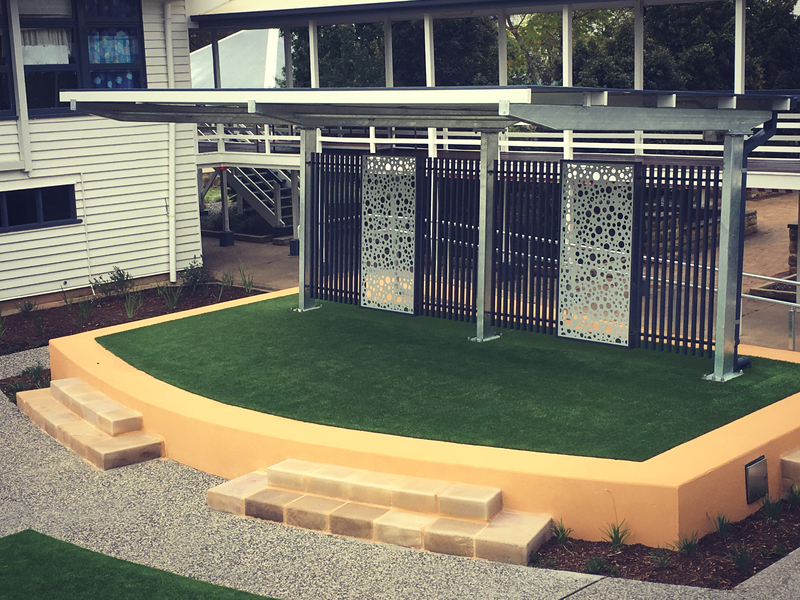 This project includes a cantilevered arbour using hot dip galvanised Australian steel and Colorbond metal roofing with stainless steel trellis sections to support vines for shade cover. 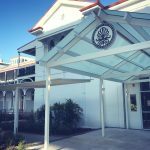 This structure was designed with a curved roof line using rolled RHS steel roof batons to conform to the landscape design. Installed over the performance stage is a cantilevered structure with columns at the rear of the concrete podium where we have installed powder coated aluminium baton screens and a powder coated laser cut aluminium feature panel. 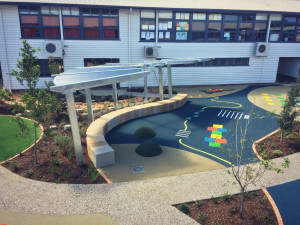 These features panels can be customised to any design and are an effective way to add a unique aspect to a project. Stormwater gutter and down pipe connections are included to reduce runoff in the immediate performance area. All structures were designed with provision for internal, unseen electrical wiring in order to accommodate outdoor, vandal resistant LED down-lights. 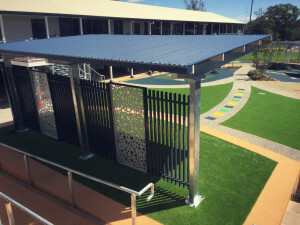 These shade shelters are frequently installed with Steel Post & Rail’s unique bench seating. In addition to these shade structures, our hot dip galvanized steel hand rail is installed. Our hand rail is designed to be compliant with ambulant standards and is suitable for wheelchair access to the stage area. Thank you for this informative blog. 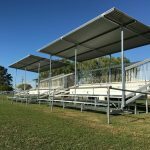 The design and purpose of your shade structure is very useful specially this summer.